Has ISRO Bhuvan Improved over two years? Prior to its launch in 2009, ISRO Bhuvan was always touted by media as India's answer to Google Earth. Like many others I was very much excited about it and made it a point to check it out right on the first day. Needless to say the excitement did not last long and I chose Google Earth over Bhuvan. 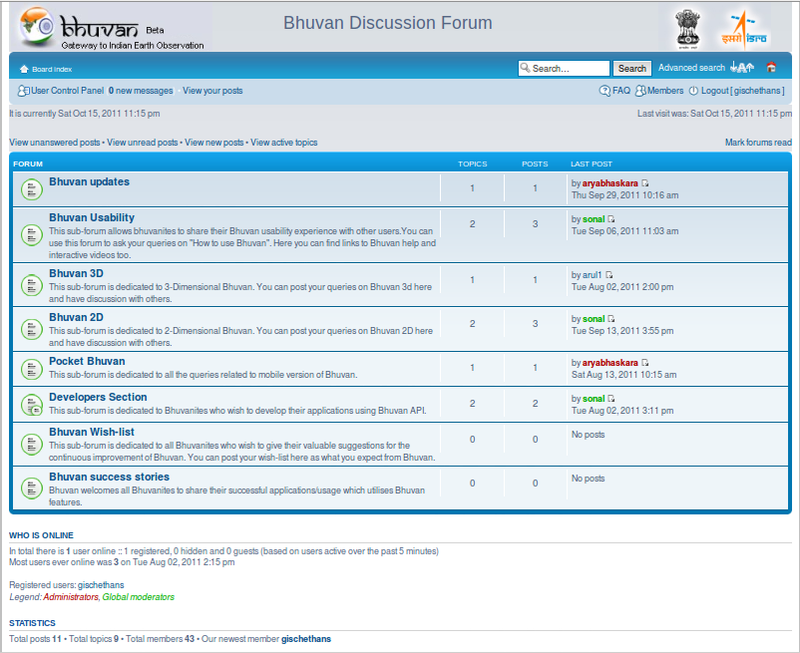 Today I decided to have a look at Bhuvan to see if things have improved over this long time of two years. Like earlier I did not have to login to have a first look. I was surprised to see this - NRSC/ISRO Open data and product archive facilitates the user to select, browse and download data from this portal which currently provides Cartosat-1:DEM:1 arc second(v1.0) and Resourcesat-1:Ortho:AWiFS data:56m(v1.0) data. For this I had to login to download data. I decided to login with my old login ID created in 2009. It didn't work. Then(in 2009) the site did not have a 'Forgot Password' link. You had to email them for password reset. Now that the link was there, I entered my email ID. To my surprise ID was not recognized. Later I could register a new account with same username and email ID!! I went on to browse normal Bhuvan thereafter. To my utter disappointment I saw no performance improvements in the system. The layers were taking several minutes to load. Forget zooming. I closed all my open tabs in Firefox on Ubuntu 11.10 to check if it made a difference. Despite of having a 3.1 Mbps internet connection Bhuvan was working as if I had a dial-up connection! 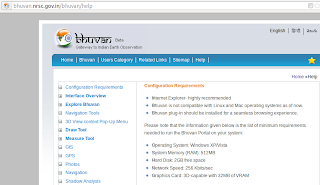 Though Bhuvan boasts of numerous features I really wonder if anyone successfully used them! Bhuvan's YouTube channel has impressive videos, but again I guess it's possible to access Bhuvan at such speeds only within NRSC office. Like many Indian Government department sites, it seems that ISRO too believes that "Windows is the only OS and IE is the only browser in the world". 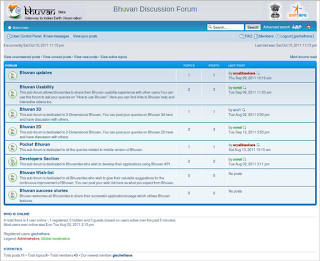 Ever since its launch there have been words of Bhuvan coming to Linux, which still remains a distant dream as 3D version of Bhuvan is not yet available for the platform. Ironically India's e-Governance policies stress on open standards. 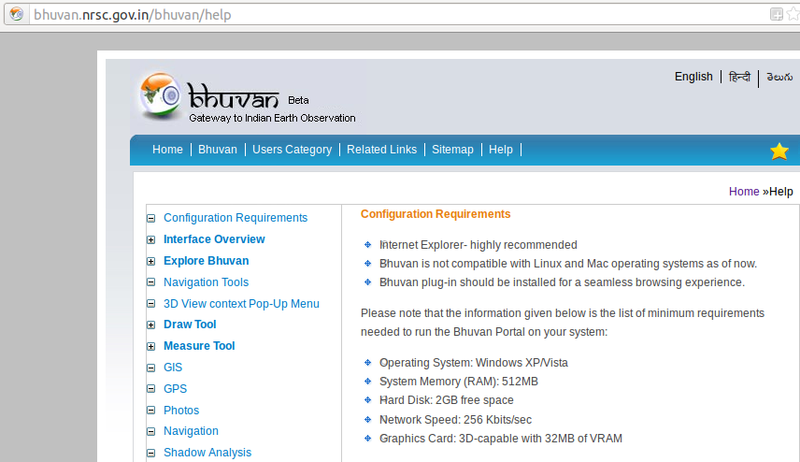 Again it seems that makers of Bhuvan are not aware of Windows 7 presence. System requirements page still shows XP/Vista as OS choices. Even on newly started software forums the statistics would be better. So is there any scope for improvement? Yes, definitely there is scope for improvement. There is absolutely no need to compete with a giant like Google. ISRO with its small team can concentrate on making Bhuvan more useful to researchers rather than to those who want to go on shopping. Google is a well established player in this segment and though competition can bring improvements it's not necessary(and not possible!) for time being. Like Google Earth for desktop environment, a Bhuvan client may be provided in place of the present 11 MB 'plug-in'. A desktop application can provide more capabilities and export feature facilities can be a big plus for users.